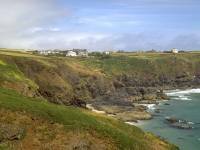 At Lizard Point the coastline begins a long, gentle curve that forms a vast bay stretching all the way to Start Point, south of Dartmoor. Not a single atlas or map in my possession gives this bay a name - it ought to rejoice under the name of Plymouth Bay, or the Cornish Bight, or some such grand title, but my sources of information are silent on the issue. 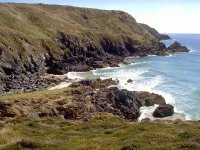 However, the practical consequence of entering the first sweep of this bay is that the coastline beyond Lizard Point generally faces southeastwards. 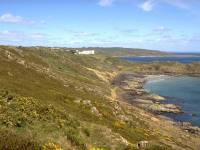 Plymouth Bay, as we will call it in the absence of an official title, forms itself into a series of smaller bays separated by prominent headlands, and the view from Bass Point - the eastward corner of the bluff that is the Lizard - encompasses a number of these features. 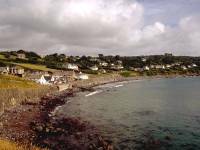 Cadgwith Bay sweeps around to Black Head, beyond which lies Coverack Bay, hidden from view but the finishing point of today's walk. Beyond Black Head lies a whole series of headlands, diminishing into the mist; Lowland Point, Zone Point, Nare Head, Dodman, Gribbin, Pencarrow, and finally Rame Head, not many miles short of Plymouth. 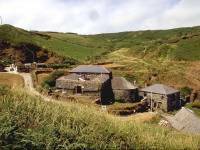 Sightings of any feature beyond Dodman, however, are rare and will only be possible on exceptionally clear days. 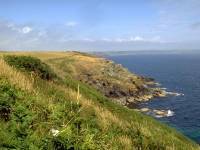 The coastline in this section, despite facing east, holds considerably more scenic interest than that around Mousehole and Penzance. 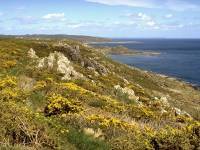 The predominant coastline type is that of heathland slope, cloaked with gorse and bracken, a riot of colour in early Spring (when many of these pictures were taken). 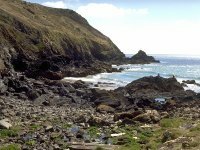 The coves and inlets, being sheltered from prevailing westerly winds, tend to be a riot of vegetation; Carleon Cove, for instance, holds quite extensive tree cover. 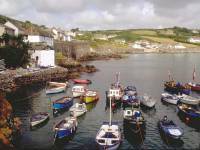 The settlements along this stretch of coast, however, are perhaps its most charming feature, for in Cadgwith and Coverack it has two of the most charming and unspoilt villages on the south Cornish coast. Having made your way back to Lizard Point from the village (and perhaps had a pot of tea at the Most Southerly Tea Shop or bought a postcard at the Most Southerly Gift Shop), make your way through the crowds and parked cars to take the path in front of the Lizard lighthouse, a grand structure which, unfortunately, is pretty well hidden from the path itself. 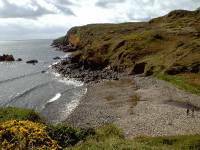 In five hundred yards you arrive at Bumble Rock and see the sweep of Housel Bay before you. 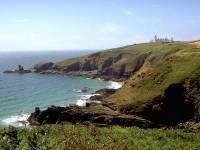 Housel Bay is a mere 600 metres across. It contrives to look much bigger. 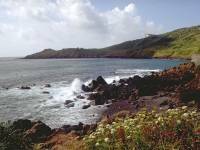 The path is initially enclosed by rich vegetation, a sure sign that the bay is sheltered from the westerly winds. 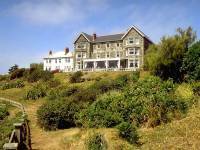 The path dips and rises quite sharply before approaching the imposing Victorian pile of the Housel Bay Hotel. The path passes right by the beautifully laid gardens and not very far from the windows of the dining room, where you will undoubtedly see the later diners still tucking into breakfast. 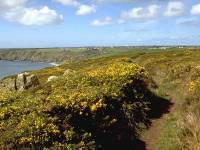 The path comes into an area of more open grassland beyond the hotel, as you approach the twin headlands of Bass Point. 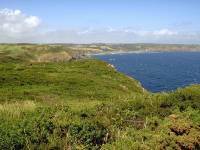 The first of these is styled as "Pen Oliver" on the map, and defines the eastern limit of Housel Bay. 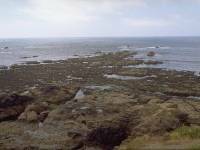 The second, three hundred yards further east, is Bass Point itself. 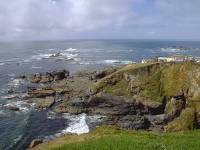 Bass Point is effectively the eastern extremity of the Lizard headland, and is a superb viewpoint. 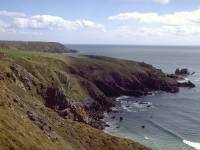 From here you look northeastwards into the massive sweep of Cadgwith Bay and towards Black Head. 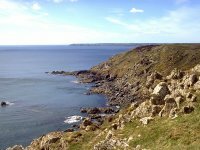 It should be possible to see as far as Dodman Point, another 55 miles away by the coast path, and perhaps even to Rame Point, almost 100 walking miles distant, if the air is exceptionally clear. 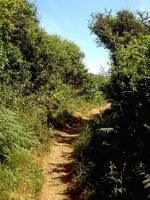 Make your way along the path, which gives easy going above steep, scrubby slopes. 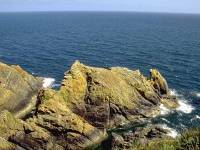 In a short while you will arrive at the new Lizard lifeboat station, an impressive though unlovely structure built into a narrow and steep cleft in the rock. 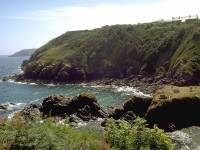 Church Cove lies immediately beyond the lifeboat station. 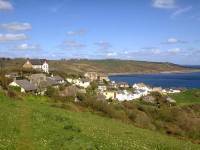 It is rather galling to study the map and discover that, after walking more than a mile and a half of coast path this morning, you are still only eleven hundred yards from Lizard village. If you were to follow the road inland you would reach the village green again in little over ten minutes. You will not give up so easily, of course, unless the weather is poor and you decide that this is not a day for walking. A little garden cafe operates in season here. 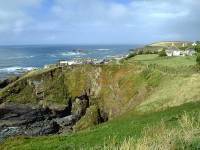 If you're ready for a refreshment break take it now, for the mile and a half from here to Cadgwith is classic Can't Sit Down country where there the path is hemmed in by vegetation and there is nowhere to sit off route. The scenery is excellent, however, with rock features such as the Chair and Polbarrow to hold your interest. Geologists and mineralogists will note the outcrops of serpentine and schist among the granite. Serpentine is easily spotted by its deep bluish colour and its tendency to polish smooth. Watch your step here if it is wet underfoot. 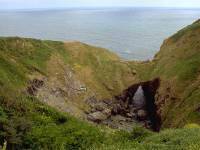 Shortly before Cadgwith you will come to the Devil's Frying Pan, a collapsed blow-hole of which the seaward arch still remains and through which incoming waves are funnelled, sometimes with some force. A wooden bench seat here gives some respite to those who have been searching in vain for a refreshment spot. 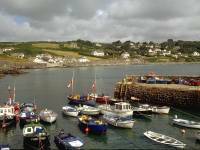 As you top the short rise beyond the Frying Pan, Cadgwith comes into view. 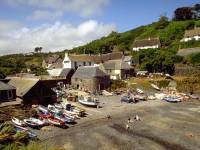 Cadgwith is often referred to as one of Cornwall's most unspoilt and authentic fishing villages. 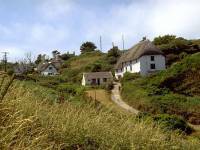 It is certainly charming but it relies to an extent on tourism. 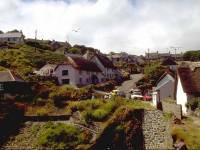 The Coast Path enters the village via a steep zigzag through someone's garden, dropping steeply to the harbour. 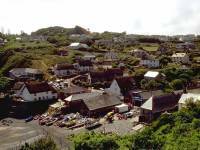 A rock outcrop south of the harbour provides a good viewpoint of the village. 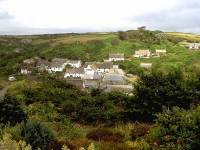 No bus service to Cadgwith but Truronian service T1 and Truronian service T3 (the Lizard Rambler) both run to Ruan Minor, 10-12 mins walk inland. 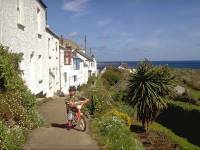 A large part of the charm of Cadgwith lies in the cluttered and haphazard arrangement of its houses and cottages. It possesses Character, with a capital C, and really makes you wonder at the lack of imagination of those who lay out roads in neat grid systems and build identical boxy houses in regimented rows. 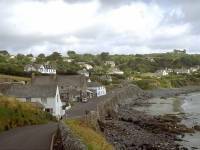 Cadgwith is exactly how an English village should look. 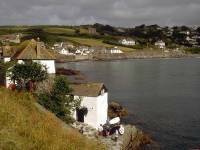 If you haven't already gorged yourself on tea and scones at Lizard and Church Cove, the courtyard cafe immediately opposite the harbour is one of the most charming patisseries in Cornwall and is highly recommended. 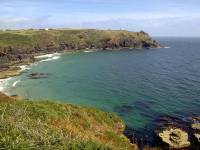 It's a fairly steep little climb out of Cadgwith to reach the cliffs above Kildown Point and Kildown Cove. 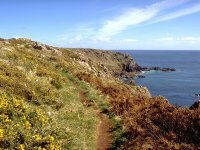 Beyond the cove, as the path approaches Enys Head, the path enters a heathland area cloaked in fairly dense scrub, and it's not difficult to go astray. 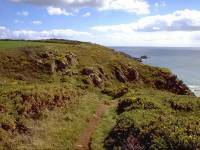 The path wanders slightly inland, avoiding the scrubby slopes, and momentarily your view of the sea is lost. 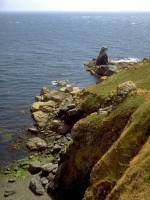 The path now drops again to Carleon Cove, seawards of the village of Poltesco. 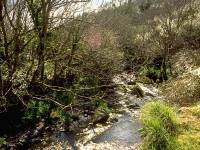 Carleon Cove is densely wooded and is a really charming spot on a sunny day, though can be a tad gloomy under grey skies. 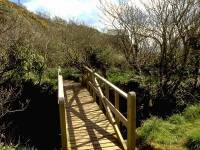 The path dives downwards through the trees and comes alongside a stream, which is crossed by a new wooden footbridge. 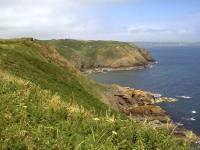 Another steep but short pull leads up and out of Carleon Cove to Thorny Cliff, a relatively dull stretch of coast. You pass seawards of a large caravan site (or trailer park, depending on which part of the world you're from), before descending once again to the rather meagre public beach at Kennack Sands. Kennack has a seasonal beach cafe but otherwise is a bit of a disappointment. 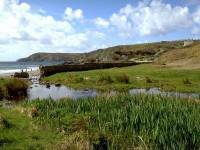 The path passes beside a sea wall which is backed by a rather reedy pond. 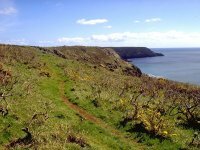 Immediately east of the beach, the path mounts a moraine-like hump to reach the long, gorse-covered stretch above Eastern Cliff. 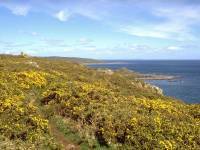 This is a beautiful stretch, particularly in early spring when the gorse is in flower. The intensity of the colours during this season is quite breathtaking, and this stretch is most rewarding on a sunny day. Heathland abuts the path to the landward side. 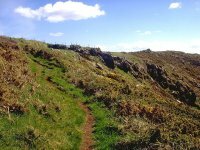 There are a number of minor coves and gullies, not really apparent on the map, which cause the path to dip, rise and twist quite a bit. 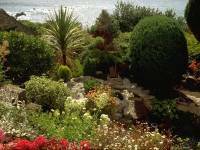 Just short of Lankidden Point, a prominent minor headland, you pass a beautiful garden on the landward side; this is Poldowrian, which is open to the public by appointment between Easter and late June. 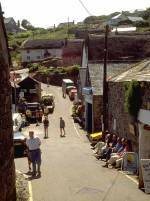 Enquire at Helston, Penzance or Falmouth tourist information centres for details. 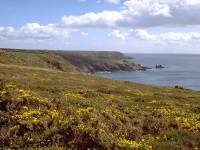 The heathland and gorse scenery continues beyond Lankidden point. 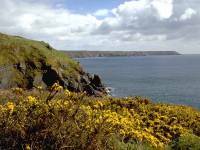 The path is approaching the bluff of Treleaver Cliff now, at which Cadgwith Bay gives out and Coverack Bay begins. 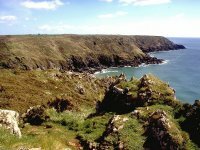 Before reaching Wreathe, the first rock outcrop on this headland, the path drops steeply into Downas Cove and climbs steeply out again. 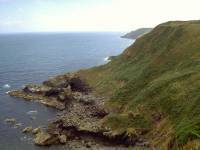 Treleaver is a complex system of minor bluffs, outcrops, gullies and coves. 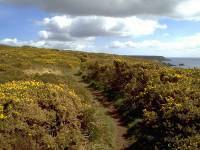 From the depression of Beages Hole, beyond Wreathe, the path becomes sketchy for a while in a sea of bracken, heather and gorse. Keep towards the upper part of the slope and you won't go wrong. 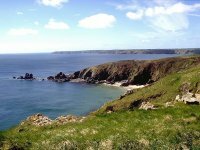 The minor bay of Dinas Cove is rounded to reach the sharp southeastern corner of Treleaver cliffs, Black Head. 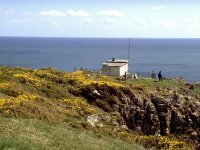 Black Head is a superb viewpoint, and this fact is confirmed by the presence of a coastguard lookout hut. 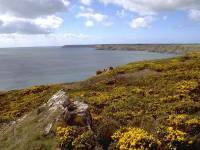 The view encompasses Coverack Bay, and the Fal estuary beyond, out to Nare Head and the Dodman. 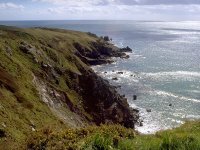 Look back at your last view of the Lizard for some forty miles, and turn north northwest to follow the path along the top of Trewillis cliffs. 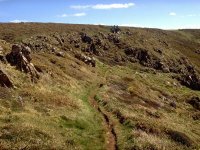 The Trewillis cliff path is similarly cloaked in gorse and bracken but is rather rougher than that before Black Head; the path dips, rises and twists over and around innumerable bumps and knolls, and the mile and a half to the headland of Chynhalls point can be rather tiring. There is also rather less rock scenery to enjoy. The path passes some six hundred yards inland of Chynhalls Point, with a spur path running out to it from the Chynhalls Hotel, a large and prominent building. 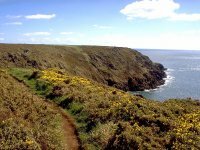 The official coast path leads northwards of this spur but I consider it more rewarding to follow a local footpath, from the small cluster of cottages that is Chynhalls village, which approaches Coverack along a beautiful lane formed by a terrace of whitewashed cottages. 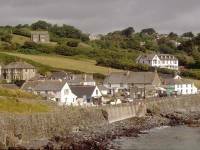 The lane, whose name I do not know, encompasses the timeless beauty of Coverack in a nutshell. The buildings seem to have grown out of the rock, so natural is their setting. 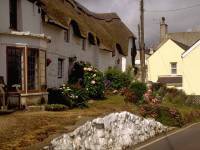 Their gardens lay to the seaward side of the lane, and include a riot of ferns, topiary work and even a model village. 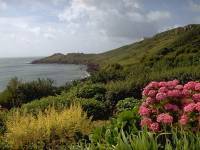 Once you can tear yourself away from this scene of serene beauty, join the road, follow the dogleg around Dolor Point and gaze down at the harbour and the main body of the village. 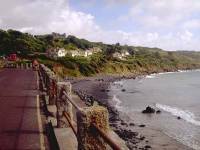 Coverack is, in my opinion, the loveliest village on the Cornish coast. 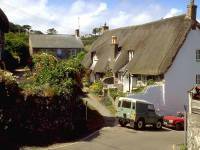 It would be a picture postcard village anywhere in England, with its jumble of lanes and thatched cottages. 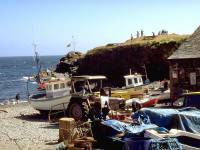 The coastal setting is merely a bonus. It scores plenty of brownie points by being unspoilt by any downmarket seaside "amenity" such as a gift shop, chippy or amusement arcade. There are a couple of pubs if you really insist on the decadent life.